Get the directions and pattern here. 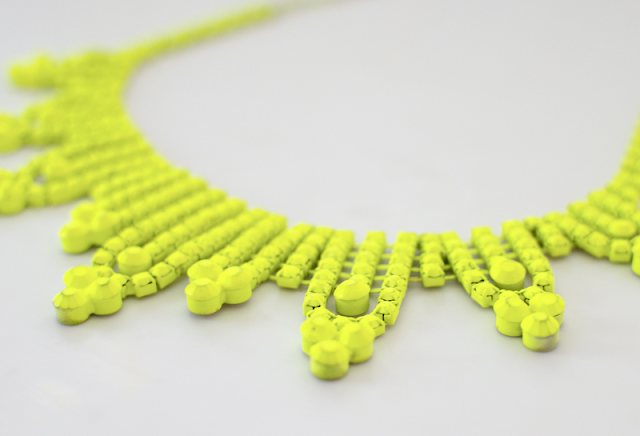 Here's another stylish necklace tutorial using polymer clay. Here's another tutorial using Sculpey. Learn how to make shrinky-dink jewelry here. Also check out this Shrinky Dinks ring. More info at I Spy DIY. Here's another variation plus directions in English. This easy hair accessory is made from plumbing rings. Reuse an old belt for this DIY. Here are the complete directions and supply list. Download the pattern (.pdf) here. If you're not a knitter, you could just wrap cuffs using the material from an old sweater. Learn this knot to make a simple bracelet out of cord. Martha Stewart shows you how to make leather studded jewelry. This dainty bracelet idea comes from Make It and Fake It. DIY brought to you by I Spy DIY. Here is the tutorial for these Chanel copycat earrings. Download the PDF directions here. Get the insanely easy no-tools-required DIY. Cut strips, braid, and wrap together for chunky bracelets. Here's a tutorial on how to turn t-shirts into a nautical bracelet. This DIY uses real twigs and spraypaint. More jewelry made from pipes, by PS I Made This. Get the DIY for this edgy ring here. Take any old piece of jewelry (one that's tarnished, perhaps?) and spraypaint a crazy color.